In the first two weeks of August 1939 the Sargeant family of Gunnersbury, West London, had a two-week holiday in Herne Bay. As far as we know this was the first family holiday not spent at Sandgate since our parents’ marriage in 1923. Dad (Charles Michael Sargeant, 1896-1978) leased or borrowed the use of a bungalow in Herne Bay that belonged to a fellow-worker at Fullers, Hammersmith. For many years now I have had an inkling that Charlie Sargeant was demonstrating his independence of his wife’s Sandgate family by going somewhere other than Sandgate for a family holiday – being born in Kent, he still made it a holiday in Kent! Mum (May Eileen Sargeant, née Prescott – 1901-1953) was born in Sandgate, was educated at the Hythe Ursuline Convent, and they were married at Hythe in 1923. At the end of that two week holiday we drove down from Herne Bay to Sandgate. When it was time for Dad to return to work my sister and brother, Ursula Wilkie (1925-2009) and Michael Sargeant – born 1928, stayed at Sandgate for the rest of the month. I was taken back to Gunnersbury with Mum and Dad. I guess that the “often stated parental” reason for my not staying in Sandgate with the others was that I was told “You are too young”, which for a 7-year old was not really true as far as I was concerned. Neither Ursula nor Michael could remember if they stayed in the Prescott houses – The Rosary and Albert House, Nos. 31 & 32 Esplanade on the western corner of Esplanade/Prospect Road intersection – or with the Bloxhams in Killarney or with the Prescotts (Uncle Jack and Aunty Eva) in Roxana, Nos. 33 & 34 Esplanade on the eastern corner of Prospect Road – the former Farleigh House. It is difficult to judge just what we children knew about the international situation. Certainly Michael recalled that he and our cousin John Bloxham were looking forward to a war as they had decided life would be more exciting in that event. He said that he still felt guilty about those thoughts, bearing in mind the outcomes for everyone. I believe that I did understand what might be in store should war break out. By the end of August 1939 I knew that Mum and Dad were anticipating that if Germany invaded Poland a war would follow - that was the general view at that time. They therefore made plans in the belief that once hostilities started London would be bombed. It was decided that the whole family would stay at Sandgate although Dad would remain in London on account of his responsibilities to his employer and to his home in Gunnersbury. During the week commencing Monday 28 August 1939 Mum was busy making blackout curtains for every window in the house at Gunnersbury Crescent – in place of the purely decorative curtains that would not have met the stringent blackout requirements. Early in the week I went with her to Acton and she purchased masses of curtain material for that purpose. There would have been so much material that we could not have carried it back home, so it must have been delivered to the house. By Friday 1 September 1939 the curtain making was finished. Dad came home early that day, and the car was loaded up for the journey to Sandgate. I can remember this aspect as it was so unusual to leave Gunnersbury at – say 5 or 6 pm – to go to Sandgate. Usually we would leave after breakfast so as to arrive before lunch. It was dark when we did eventually reach the Esplanade and I was put to bed straightaway. On the Saturday Dad drove back to London all alone. That was an unusual situation for everyone. From that weekend (2nd-3rd September) on we all slept in Albert House, but we were in and out of Killarney and Roxana all the time as usual. Like everyone else alive on 3 September 1939 I can remember the major events of that day as though it was yesterday – the 11.15 speech by Prime Minister Neville Chamberlain that followed the 11 o’clock deadline given to Germany. Almost immediately there was that air raid warning, which proved to be a false alarm. Michael said that when the alarm sounded we all went into a cellar-like structure under the garden of Killarney. I can vaguely remember that relocation of all at 31 and 32 Esplanade. There is attached a photo that shows the entrance to the former cellar of Farleigh House (so named up to 1919). That cellar was behind the kitchen of Killarney, 33 Esplanade; it is likely that the kitchen of Farleigh House was the same room as the Killarney’s kitchen. The photo was taken – in the mid-1990’s after Killarney and Roxana had been demolished and before the replacement houses had been built. The person taking the photo was Bernadette Bryant, the daughter of James Prescott – a dentist at Warminster at that time. Bernadette Bryant (1927-2014) was a cousin on the Prescott side, as her father was a brother of Mum – all of the Prescott children had been born at Sandgate. The autumn school term was about to start in September 1939. Michael and I were enrolled at the Catholic school at Hythe which at that time was located underneath the Church. Living in Killarney with the Bloxham family, (Molly Bloxham, 1897-1985, was Mum’s older sister) was Deirdre Prescott. Deirdre was the only daughter of Tom Prescott (Mum’s youngest brother) by his deceased first wife. Our two cousins, Yvonne Bloxham and Deirdre Prescott, were pupils at the convent at Hythe, to which Ursula was supposed to be going with them. Ursula flatly refused to go. To this day Michael could not and I can’t understand how she got away with it! Early one morning in the middle of September Mum came into the bedroom that Michael and I shared, which was located in the front of Albert House and told us to come to the window. What we saw was a mine bobbling along amidst those rocks that are close to the shore on that part of the Esplanade. It was low tide and everyone was worried in case the mine hit against the rocks and exploded. By the time that we were ready to catch the bus to the school in Hythe the mine had moved westward with the tide and was somewhere close to West Lawn and Brewers Hill. In those days we used to go home from school for lunch. That day we caught an East Kent bus from nearby the school for lunch at The Rosary, where we all ate in the kitchen on the lower ground floor at the back of the house. 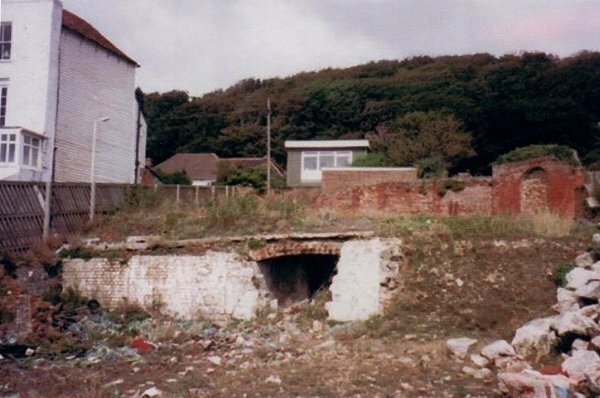 When the bus reached Horn Street the conductor told us that the bus could not travel along the Esplanade to Sandgate and Folkestone as “soldiers” were defusing the mine. Michael asked whereabouts the bus would return to Sandgate High Street. We were told that it would come down Military Road. However we were then told that there would be extra fares to be paid for us to continue for that extended journey. Since we did not have any money for such fares, or anything else for that matter we were told to leave the bus. Of course we could have followed the bus up Horn Street and found our way back home. We chose instead the direct route along the Esplanade. We passed the “weapons disposal unit”, hoping that they did not have a mishap as we walked by. Mum and the rest of the Prescott household were appalled at our account of the break in this journey, when we eventually reached The Rosary. Mum was furious, but strangely enough for her she did not immediately get on the phone to East Kent Bus Co. to complain. Instead she told us that we did not have to go back to school for the afternoon session, so that was a plus for us. Everyone, without exception, said what a pity it was that a Sarjeant Brothers bus did not pass by during our walk. If one had done so we could have hailed it and have a free ride since we had a family relationship with Charlie Sarjeant (one of the proprietors and drivers) as he was married to Dad’s sister Edie. We had and still have Sarjeant cousins. That relationship and the two surnames of Sargeant and Sarjeant caused some confusion for many people throughout the 20th century. Later in the afternoon and by the time that Yvonne and Deirdre had come home from the Hythe convent, and John Bloxham had come home from Harvey Grammar, we were told that the “weapons disposal crew” had completed their task without incident. The mine was then sitting on the beach somewhere outside or beyond Wellington Terrace. We all rushed off to view this miracle. Well probably not all of us as it was unlikely that Ursula would have bothered to run along the beach with us, or along the Esplanade. But the rest of us, five of the ten Prescott grandchildren, two girls and three boys, all tore along to see the mine. The tide was in and the mine was just resting on the beach with a crowd of onlookers all around it. Really there was not much to see, but it was a piece of excitement that made up for the lack of warfare since Sunday 3 September 1939. Deirdre’s reaction to the sight of the “stranded” mine was very memorable. She drew her finger along its rusty surface, showed her finger to the rest of us, and said “I am never going to wash this finger again.” While I was suitably impressed I thought to myself “I know that Aunty Molly won’t allow Deirdre to get away with that. It will be ‘no dinner, my girl, until you have washed your hands’.” The next day there was no evidence of rust on Deirdre’s finger, nor was there any mention of Aunty Molly’s method of achieving same. By the middle of October 1939, when the mid-term school holidays came along, Mum had decided that she had had enough of staying in Sandgate waiting for the war to start. She did not tell Dad what she planned to do, though she must had discussed it all with her parents, Ellen, the Bloxhams, etc. All our luggage was packed and it was shipped back in the luggage van on the train that we took to London, for we must have had a great deal of clothing with us, all taken to Sandgate in the car. From Charing Cross Southern Railway Station we walked down Villiers Street to Charing Cross (as it was then called) District Line/Inner Circle Line Station and caught a District Line train, with a change at Earls Court by the Piccadilly Line, to Acton Town Station, from where we were able to walk the short distance home. The luggage was presumably delivered either that day or the next. Dad was suitable surprised to find us at home when he came back from work. But he did not insist that we went back to Sandgate. In fact that would have been a travesty bearing in mind the situation in Folkestone that was to eventuate within twelve months and after the Fall of France. This period in 1939 from September to October was the longest period of time that Mum and Dad had been separated throughout their married life, for we cannot recollect that Dad went down to Sandgate from London all the time that we were there. It is no wonder Dad did not send us back to Folkestone/Sandgate. By the end of the mid-term school holidays Gunnersbury Grammar School re-opened with many fewer pupils. By the beginning of 1940 pupil numbers were back to normal levels. So Michael and I went back to that School in October. Ursula did not go back to the convent in Little Ealing for the remainder of the school term - instead she was booked into the Pitmans Secretarial College in Ealing to commence in January 1940. So she, as always career-focused, got what she wanted, and also managed to stay at home until after Christmas 1939! Bernard Sargeant, Sutherland, N.S.W., Australia – this item was revised, with the addition of the photograph of the Killarney cellar, in August 2015.